Do you want a dependable and stylish SUV? The 2016 Honda HR-V is the right choice in a smaller SUV. At Ceilidh Honda of New Glasgow, NS we carry a big selection of Hondas, including HR-Vs in different trim levels. Ceilidh Honda of New Glasgow, Nova Scotia offers all of the Honda models, including the impressive 2016 Honda HR-V. We stock vehicles with a range of options and packages to suit any shopper’s tastes and budget. As one of Nova Scotia’s top Honda dealers, we are proud of our history of providing amazing service to go with great Honda cars and SUVs. We serve Honda owners and potential Honda buyers throughout New Glasgow and Antigonish, NS from our dealership, conveniently located at 393 Westville Road in New Glasgow. Don’t hesitate to get in touch and schedule a test drive today. The compact, stylish and reliable 2016 Honda HR-V offers the SUV buyer great performance in all three models. The peppy 1.6 liter, SOHC, 4-cylinder engine delivers 141 horsepower while offering a wallet-pleasing 9.3L/100km city and 7.0L/100km highway* fuel economy. The 6-speed automatic transmission with Econ Assist button helps keep things efficient. All HR-V models offer adequate ground clearance for your off-road adventures. You will appreciate the added security of all-wheel drive (AWD) and all-season tires even if you never go off road. On the road, the AWD system makes it easier to deal with rain, snow, and ice. You also be pleasantly surprised by the small HR-V’s ability to hold people and their stuff. The HR-V includes a variety of active and passive safety features. Many of those features are standard in all models; other features come with one or two of the HR-V models. Those standard safety features include anti-lock brakes, front airbags, and side-curtain airbags. Vehicle Stability Assist with Traction Control, Trailer Stability Assist, Road Departure Mitigation, Brake Assist and Electronic Brake Distribution all help you stay on the road and in control. An auto-dimming rearview mirror on the EX-L Navi helps make night driving a little easier. A standard theft deterrent and security system helps to secure the vehicle and its contents. The EX-L Navi model adds Lane Departure Warning and Forward Collision Warning systems for an added degree of driving safety. The wide variety of standard and optional safety features combine to make the HR-V a safe and secure vehicle that doesn’t cost a fortune. 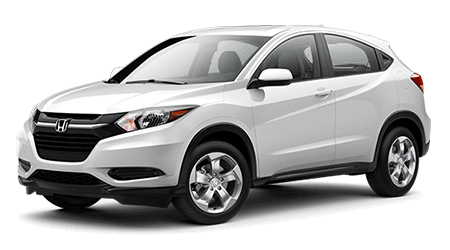 The comfortable and compact Honda HR-V exemplifies Honda engineering and design; it offers a safe and luxurious driving experience that will impress any owner or passenger. If you want a compact and affordable SUV with good performance, fuel economy, and safety the HR-V is a terrific option. At Ceilidh Honda, we look forward to showing you our selection of HR-V models. Come to our dealership on 393 Westville Road in New Glasgow and test drive a Honda SUV today! *Estimated fuel economy based on Government of Canada’s 5-cycle testing method. Your actual fuel consumption will vary based on driving habits and other factors – use for comparison only. For more information on 5-cycle testing, visit http://vehicles.nrcan.gc.ca.